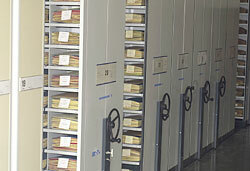 The herbarium of the Botanische Staatssammlung München (herbarium acronym: M) comprises about 3.2 million dried specimens of plants and fungi and is systematically arranged. Associated are a liquid collection, microscope slide collections, illustrations of plants and fungi, and dried fruits and seeds. The collections are worldwide in scope, but with particular strengths in the flora of Bavaria and the Alps, the vascular plants of Brazil, Chile, Middle Asia and parts of Africa, as well as in lichens and fungi. The herbarium grows at an average rate of 16,000 specimens a year and is estimated to house about 25% of the known species of the world. The collections are available for study after prior arrangement with the curators. Members of the curatorial staff will provide a brief introduction about how to use the collections. The booklet (in German) is illustrating themes on history, collections and research focus. Around 150,000 data records and images referring to herbarium specimens, microscope slides and water colours are online accessible (see Collections Online). A compilation of the collections and an index of the collectors is given by HERTEL & SCHREIBER 1988: Die Botanische Staatssammlung München 1813–1988 (Eine Übersicht über die Sammlungsbestände). – Mitt. Bot. Staatssamml. München 26: 81–512. The work is continuously extended. The updated version is online available under the title Index to the collectors represented in the Herbaria M and MSB. Short portrayals of collectors are presented under Collectors Online. Loans of herbarium specimens are granted following standard regulations. For loan management we use DiversityCollection, one of the modules of the Diversity Workbench.